This review is about something that I have wanted to try for a really long time. These have been on my wish list for months because I have seen them splashed all over the internet, whether it be on blogs or YouTube. Then, I was browsing the House of Fraser website the other week and I saw that these bad boys were in the sale with a couple of pounds off so I decided to go for it and treat myself to a couple. I say treat myself, like I never spend money on makeup, but I am sure that you guys know what I mean. I justify it to myself by saying that they were a bargain but I only got about £1.80 off each one! I wanted to try these out because I always go for really neutral eye looks. Even if I have an event where I want to look a little more glam for, my makeup never really gets very extravagant, I just always want to go for looks that are timeless and when I look back on photos it isn’t going to be too garish and my toes aren’t going to curl up while I cringe. And, I think things like this can be the pop of something extra that my look is sometimes lacking to make my eye makeup look a little more special compared to my everyday makeup look. The first one of these that I have been trying out is the Eyes to Mesmerise in the shade Bette. 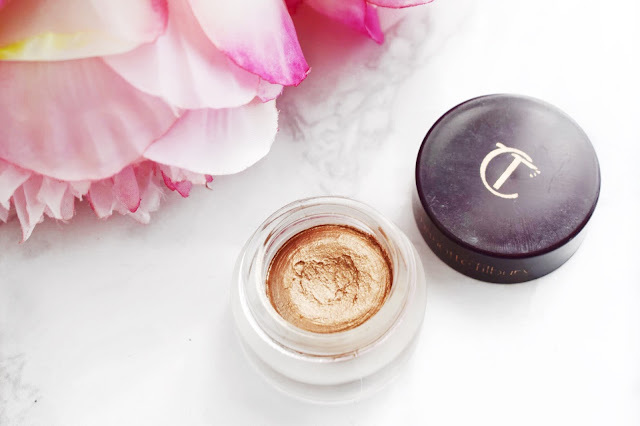 I thought I would start out with this one because it matches the colours that I already use around my eyes because I love neutral and bronze tones and this is a gold shade cream eyeshadow. I will say that when I first got this and I went to start using it I did put off dipping into it because of how stunning it looked in its little pot, I didn’t want to ruin it. It was a similar feeling to when I first got the Kevyn Aucoin Sensual Skin Enhancer and that looked really perfect just sat in the pot that it comes in. 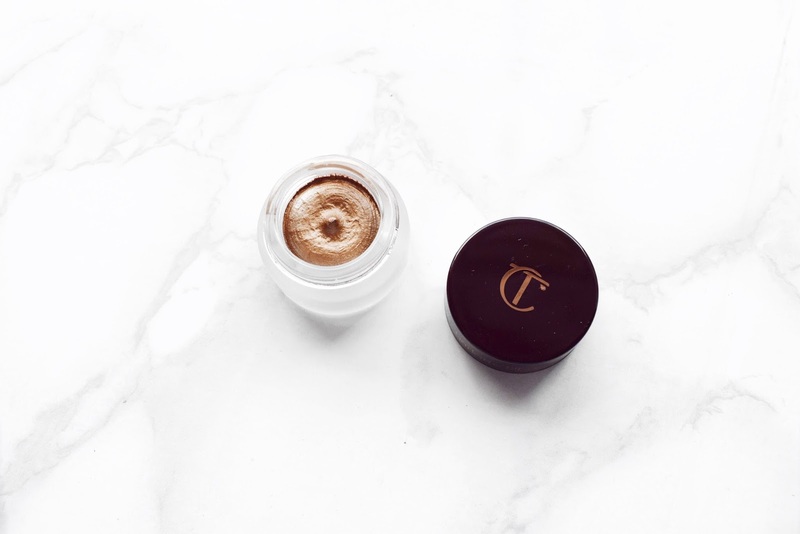 Since I have been using this Charlotte Tilbury Eyes to Mesmerise in Bette I have been using it just to add a pop of glitz to my boring eye look. I normally just go in with MAC Woodwinked all over my eyelid and then I will blend that in using MAC Cork through the crease. With this, I just take my ring finger and press a small amount of the product onto the centre of the eyelid. I find that it really helps to make the Woodwinked shade below really pop and I find that it is a good base for this cream eyeshadow to sit on top of. I just find that this neutral but glittery eye look is subtle but looks really pretty. What I found when I was using this is that it doesn’t dry down very quickly. I kind of expected to lay this Charlotte Tilbury Cream Shadow down, give it a couple minutes and then be able to move on with the rest of my eye makeup, like liner and mascara. I found that it does take quite a while for it to dry down. I left it around 10 minutes and it still felt quite moussey on my eyelid, even though I had only applied a really small amount, so it wasn’t thick or built up on my eyelid, it was just a nice thin layer, enough to show the true colour of the eyeshadow. Then, when I applied my Seventeen High Drama Eyeliner I did notice some of the cream shadow transferring onto the wand and it was quite hard to draw a precise line. But, other than that, I have to admit that I really love this cream eyeshadow. I think because of the stunning gold colour, it just reflects the light around my eyes and makes me look much more alive and awake. I can see this one little pot lasting me a really long time because it is really nice and pigmented. I have used this on its own without MAC Woodwinked underneath and I still love it, so quick and easy for just swiping a quick flash of colour to the eyelid. You can pack it on to get it very opaque or you can take it on a buffing brush like a MAC 217 and the reflects of the glitter will still be there but it will look overall much more sheer. After trying this product, I am so excited to try out some more of these over the next couple of months. As always with my reviews I will leave a link down below to where you can find this product in case you want to check it out. Also, be sure to leave me a comment and let me know if you have tried this and what you thought about it! It is a lovely product, I can't wait to try out more of them! This sounds lovely, I really really need to try this brand out! I don't think you will regret it, everything I have tried by CT has been incredible! Me neither, it really makes my eyes pop! Me neither but these just seem to work so well!